It isn't rocket science to figure out why more and more people are opting to go all-out minimal in their everyday habits and in the spaces they inhabit. Minimalism, and as an extension, simplicity, are both a reaction to the growing complexities of our modern world, the antithesis of 'the more the better'. Simplicity clears the clutter from physical spaces, which in turn makes space in our heads. When it comes to design though, it's a fine line between minimalism and straight-out boring. Good minimalist decor and design is pared down to bare essentials while paying attention to intriguing details. It is exquisite simplicity paired with conceptual clarity. One of the most crucial elements of Asian-inspired design is balance. And we're not just talking about colours, but textures and elements creating harmony as well. The architects here show their mettle by breaking up the classical wood exterior and introducing glass and concrete elements. This softens the harshness that often accompanies cubist structures but stills maintains its modernist features. It's a house that elicits a second glance because of its soothing symmetry; the strategically-placed greenery in front and behind the property adds to the pleasing aesthetics. The half wall that you see from the front—and that ensures privacy for the residents—also doubles up as a perfect outdoor seating area. 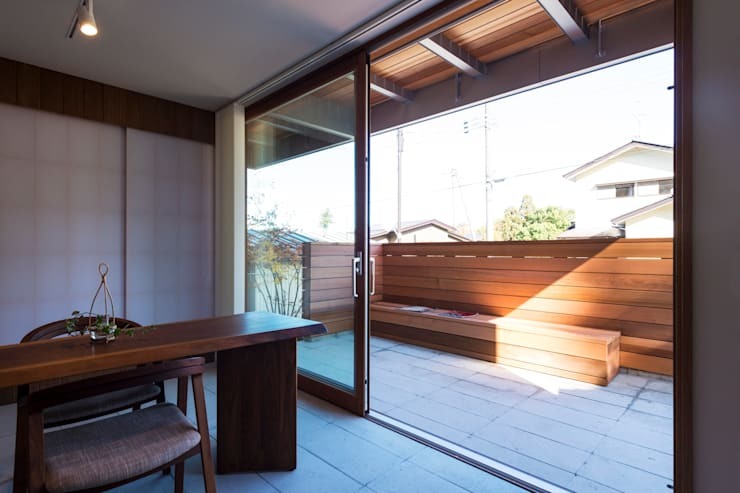 The living and the dining space is therefore cleverly shielded from the glances of passers-by while affording residents a chance to step out onto the porch and still be guaranteed privacy. The glass sliding doors and the concrete flooring in the dining space help in the seamless merging with the outdoor area and give off an open, airy vibe. Not to mention, it is so much easier to clean these floors! Wood is clearly the material of preference here. And really, is there any other material that imparts a feeling of such warmth as wood does? The flooring in the seating area and the kitchen, the wooden panels on the walls (which are exactly like the outer facade) and the modern yet rustic-inspired dining table are all softened by the pristine-white ceilings and the concrete flooring. We also love how the log burner almost acts as a separator between the dining and living space. 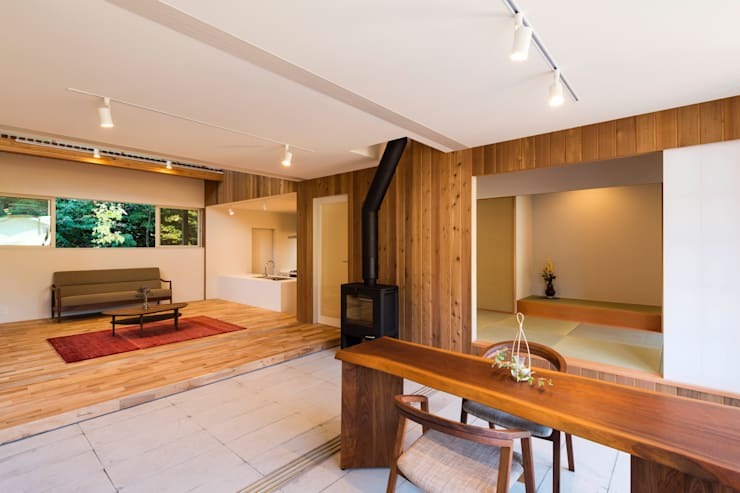 To the right is a traditional Asian living room with tatami, stripped down to the bare essentials. 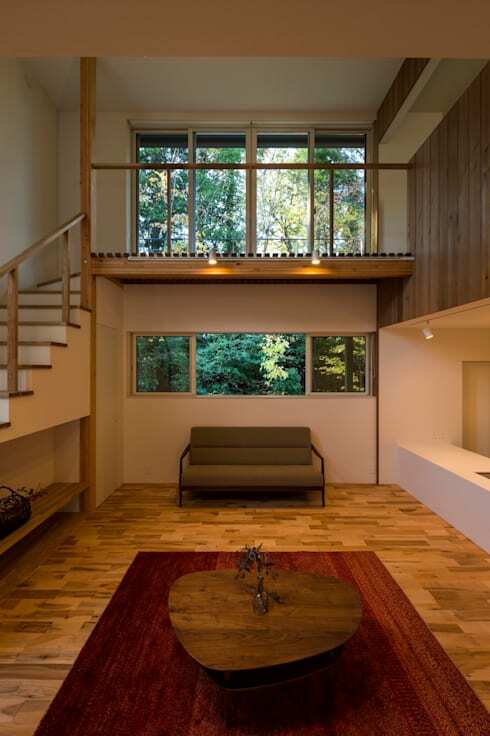 For further privacy, the space can be closed off—beautifully achieved by a wooden frame with rice paper panelling. Surprised at how spotless the kitchen looks? We were too. 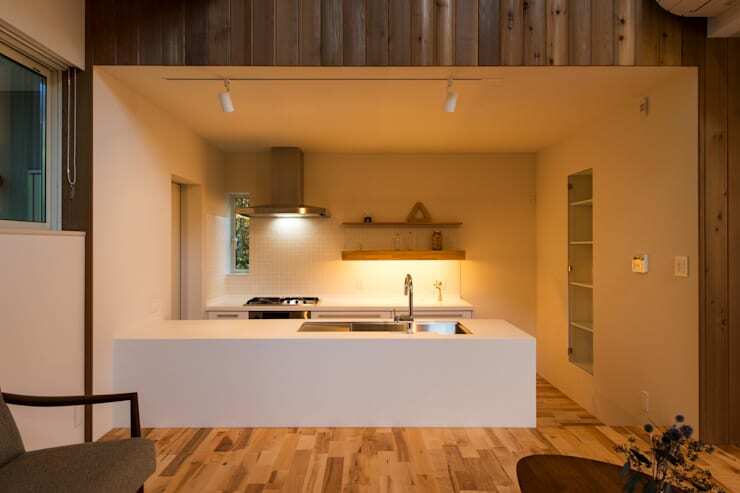 This the architects managed by not only designing a super minimalist space but also tucking in a room to the left where all the unseemly kitchen stuff can be dumped—a modern store room, if you please. You'll also notice that there are no kitchen cabinets, instead there are simply two shelf spaces. The pure white kitchen island cleanly separates the living space, while allowing for a free flow. And the low-level lighting creates a cosy glow. Who wouldn't want to hone their cooking chops here? If you are looking to get a kitchen makeover done, these are your go-to guys. If this isn't understated furnishing, then we don't know what is. Keeping it simple is a linear sofa that is so symmetrically placed, it would make Wes Anderson weep with joy! Adding the one singular pop of colour is the deep red carpet and on it sits a gorgeous, organically-shaped coffee table. What is in the foreground here is actually what is in the backdrop—the lush greens behind the house. A flight of stairs takes you to the second balcony of the property (the other one is front-facing) where we can perfectly imagine switching off, even if for only a short while. If you're looking for more Zen spaces, A Japanese monochrome oasis is sure to inspire you. 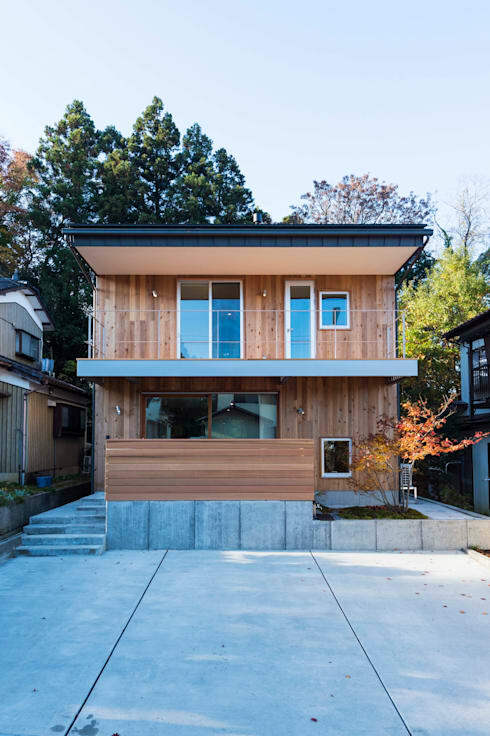 What did you think of this stunning Japanese home? Let us know by leaving a comment below!